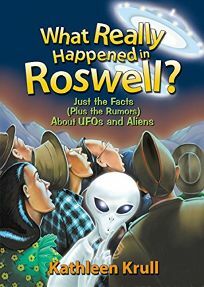 Kathleen Krull dishes the dirt on What Really Happened in Roswell? Just the Facts (Plus the Rumors) about UFOs and Aliens, illus. by Christopher Santoro. What started all the talk about flying saucers and alien landings in that isolated New Mexico town? Krull presents the different stories that have been told since the first discovery of unusual silver scraps in 1947, ending provocatively, ""Is the story over?""